This entry was posted in Uncategorized and tagged blessings, Christian images, inspirational, leaves, photography, thanks, Thanksgiving on November 28, 2013 by heavenlyraindrops. Beautiful Sue … must have fallen from the tree called ‘Blessings’. I love this photo! What a great way to showcase what God has provided. Blessings to you on this holiday. Thank you Julie. Blessings back as we celebrate the giving of thanks! So beautiful! What a great reminder of all the little thing, the many blessings we enjoy. Happy Thanksgiving! Thank you for sharing with us. 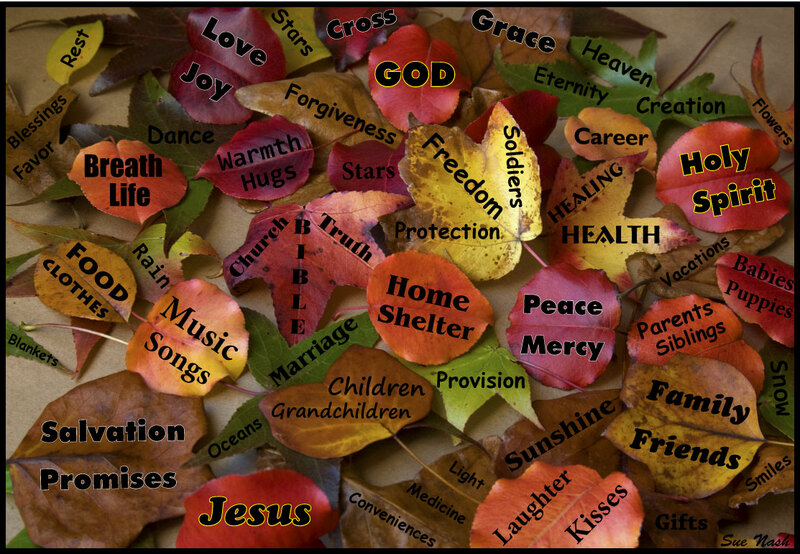 Have a blessed and joyous Thanksgiving Day! So thankful for blogging friends like you, who continually point us to the Lord. Many Thanksgiving-blessings to you and your family! And to you, Heidi. BTW. I have really been enjoying giving your cards to others. They are anointed and lovely.